The Tata Hexa Downtown has been launched in India at a price of Rs. 12.18 lakh and will be available only in limited numbers. The Hexa Downtown gets a lot of new features. The engine options remain the same though. Tata Motors have launched the Hexa Downtown Urban Edition in India. The Hexa Downtown will be available with two packages, which are 'Absolute' and 'Indulgence'. The prices of the Hexa Downtown start at ₹ 12.18 lakh (ex-showroom, Delhi) for the XE variant of the Hexa. 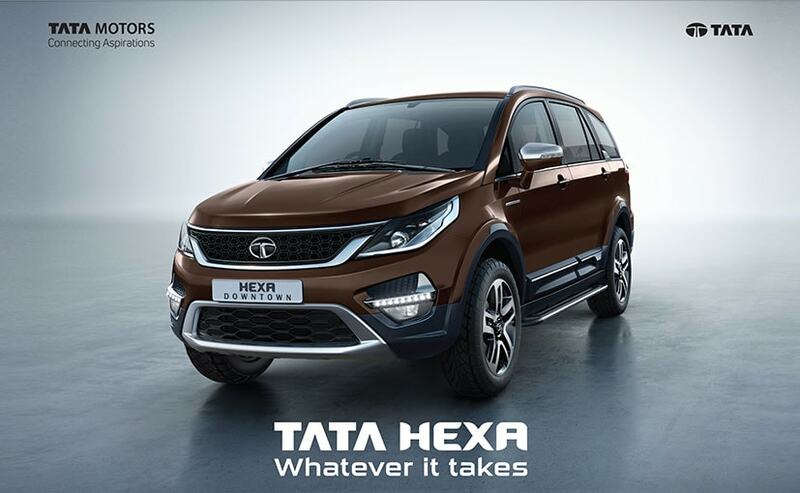 According to Tata, the Downtown edition of the Hexa amplifies the luxurious side of the SUV. The prices of the regular Tata Hexa start from ₹ 11.72 lakh for the XE 4x2 variant and goes up to ₹ 17.07 lakh for the XTA 4x2 variant. Mayank Pareek, President, Passenger Vehicle Business Unit, Tata Motors, said, "In order to offer our customers with an adrenaline pumped driving experience, we are happy to introduce the urban edition of the successful and versatile SUV, Hexa. The Hexa has caught the imagination of the country with its distinctive on-road and off-road capabilities. It has completely changed the face of Tata Motors and witnessed a strong traction in the market. The Hexa Downtown, as the name suggests is a vehicle inspired by the city life to match the customers' charged urban lifestyle. 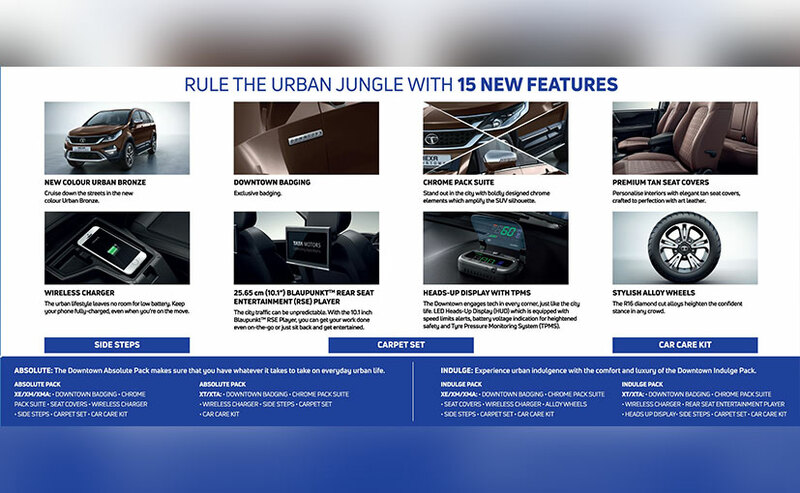 With the new edition of the Hexa Downtown, we are sure to take forward our brand promise of offering customers aspirational products along with sheer value. The Tata Hexa Downtown edition gets up to 15 new features as compared to the regular Hexa. Up first is the new Urban Bronze colour for the exterior on the Hexa Downtown. Also, the SUV gets exclusive 'Downtown' badging. Also included are new tan leather seat covers and a chrome suite pack, which adds a dash of chrome on the front end, side-steps and the wing mirrors. Additionally, in order to makes even more comfortable, the Hexa Downtown also gets wireless phone charging and 10.1-inch rear seat entertainment unit from Blaupunkt. Rounding up the list of new features is a heads-up display (HUD), a tyre pressure monitor system and newly designed 16-inch alloy wheels. The Hexa was already a feature-rich SUV and now with these additions, it sure takes the premium-ness a few notches higher. In case you want to get your hands on one, make sure you go to a Tata dealership at the earliest as the Hexa Downtown will be available only in limited numbers.